So what started out as a tidy up of a few song tags has resulted in me staying up all night, bleary eyed, to finally get everything together and release an album properly. I remember thinking out loud on here once about the difficulty of knowing where and when to draw the dividing line in a collection of tracks and separate them off as an individual package or collection. It turns out that that sometimes that realisation of when is appropriate creeps up on you and presents itself magician-like out of the blue, seemingly stating the obvious. 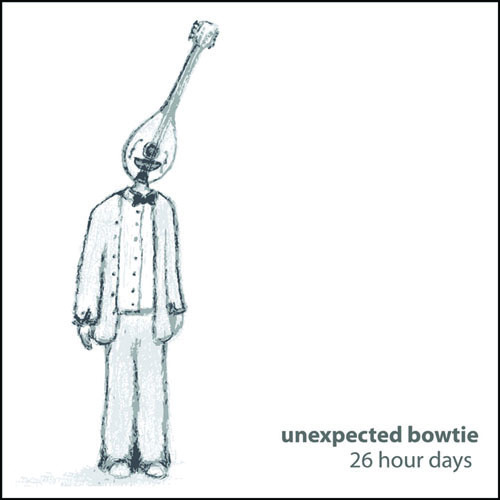 As a result, you can now download the resplendent debut ‘26 hour days‘ in its entirety, along with lyrics, printable artwork and all that by clicking through to the relevant page via the bowtie-man crested image above. If you’d rather just stream or download the tracks individually, you can do that too. and with that, I leave it in your hands.